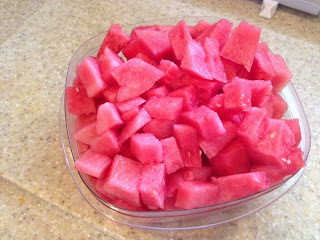 If I had to select a favorite fruit - watermelon would be right up there in my top 3. I also love fresh pineapple, coconut and...apricots in season. 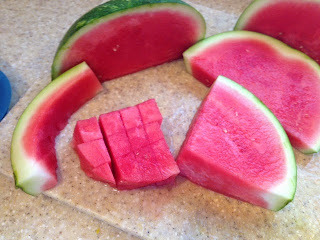 Anyway, Grandpa bought the first watermelon of the season and...we cut it up and shared it with him. It was delicious so...I just had to share the joy! mmmmm. I'm grateful that the Lord has provided so many wonderful things for us to enjoy; fresh fruits, vegetables (I love fresh carrots and peas from the garden), blue skies, sunshine, ocean breezes, majestic mountains, clouds on a summers day, birds chirping in the trees etc. What a wonderful world we live in.